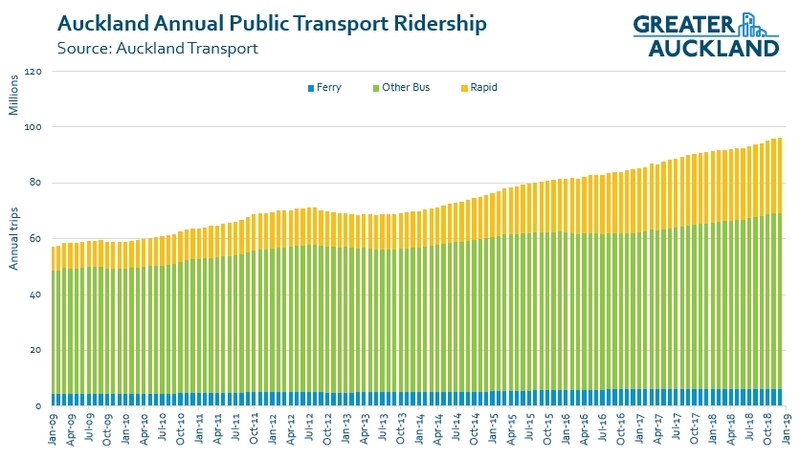 With public transport fares set to increase this weekend, it’s useful to look at how public transport use has been growing and with December’s ridership numbers now out, we can do just that. 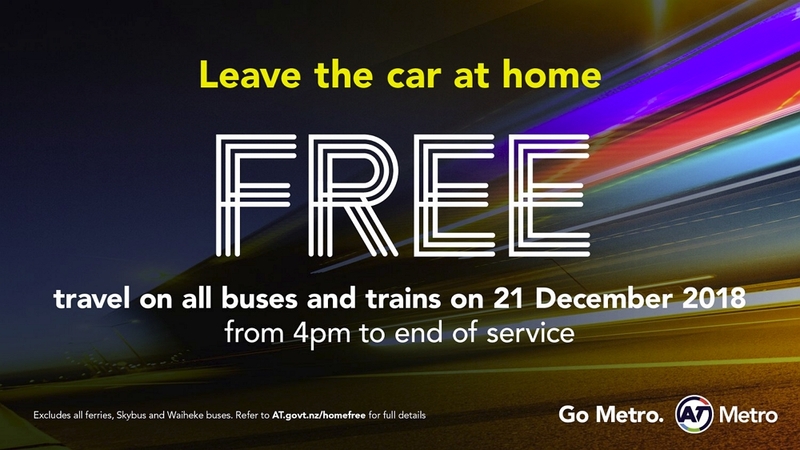 We’ve also been waiting to see the outcome of Auckland Transport’s free afternoon on buses and trains on the Friday before Christmas and yesterday they finally provided that. 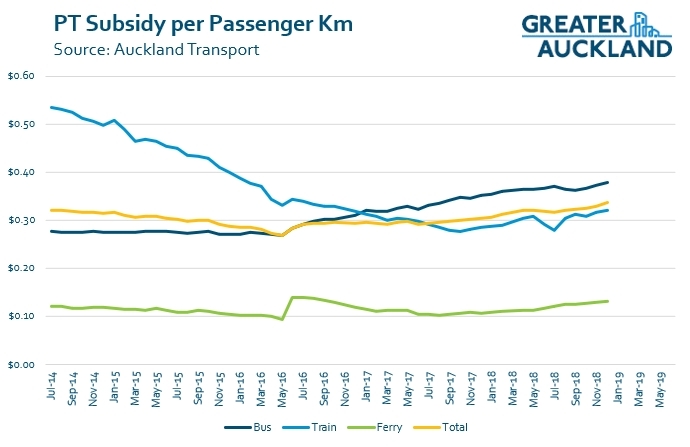 First, we’ve been seeing good growth on PT, particularly on buses over the last six months sine the new network rolled out on the Isthmus in July and on the North Shore at the end of September. 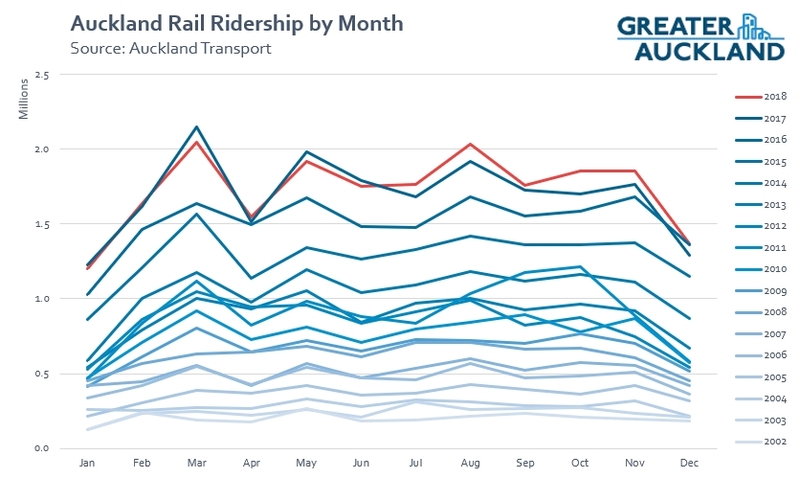 Overall ridership in December was up 4.9% on December 2017 which is nice but not as good as we’ve seen in some other months. In saying that, December is always a more variable than most months due to when Christmas falls so that is likely to have played a part – in 2017 there were 16 days in the month before usual holiday period vs 15 days in 2018. But as you can see below, some of that outcome was negatively impacted by ferries which saw a 5% decrease in the month. The data suggests this was primarily driven by drops in usage on the fully commercial services (Devonport and Waiheke). Overall we ended 2018 with just over 96 million boardings, up from 91.1 million at the end of 2017 and most of the growth occurred on the Rapid and Frequent transit network, much of the latter thanks to the roll out of the new network. This suggests our usage 56 trips per person annually, up 1.7 on the 2017 number. This is still low by international standards but much better than 10-15 years ago when it reached a low of just 36. 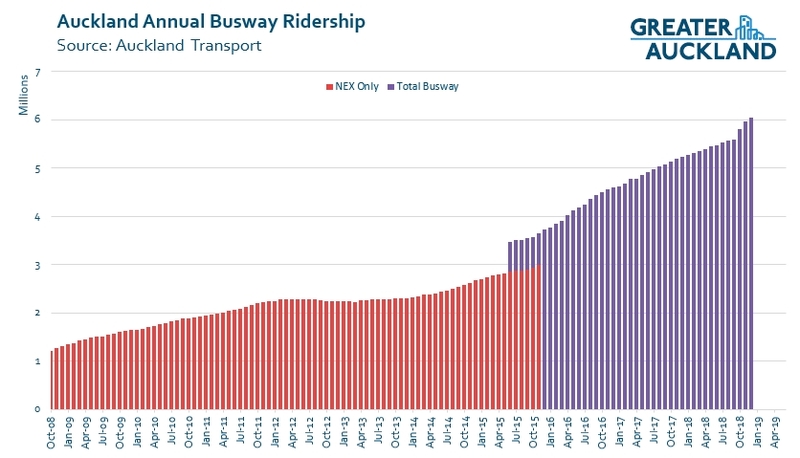 Looking at some of the results from above a little more closely, you can see the busway had another fantastic month and in December passed 6 million annual trips first time. If the current growth continues, it will quickly become our single busiest PT line – currently the Western Line with just over 7 million boardings annually. The rail network definitely had a year of two halves, the first half saw usage decline slightly as the post electrification boom wore off. But the second half of the year turned that around ended the year slightly higher. In total there were 20.7 million rail boardings in 2018, up from 20.4 million in 2017. As mentioned at the start, one of the things we’ve been looking forward to finding out is the impact of the free afternoon of buses and trains on December 21. AT introduced this following a request from the police as they say the Friday before Christmas is one of the worst days for drink-driving. For the first time trying it, December 21 is was probably one of the better days as all normal services are running but without school/uni students and with many people already on leave, it left plenty of spare capacity that could be used. I left work just after mid-day on the 21st and so didn’t make use of the free travel but I did notice a lot more people than usual heading towards town. Most notably a lot of parents taking their young kids. Compared to the Friday before Christmas in 2017, the number of patrons after 4pm on the trains on Friday 21 Decembers jumped from 15,809 to 41,082. We couldn’t accurately count the numbers on the buses but numbers were up by as much as 50 percent. A great response from commuters. These are some very impressive numbers and help to highlight that there is a lot of demand for PT but that for some, price is a barrier. In saying that, I suspect some of the trips were perhaps for the novelty of it and might not normally happen if significantly cheaper or free PT was a regular occurrence. To put things in perspective, on the rail network we annually average just over 72,000 trips per day, although most months are in the 75-80k per day range with lower results in December and January. That means the Friday afternoon represented about half a normal day. Note: Buses average about 237k trips per day. Police had 9 checkpoints around Auckland – 14 people are going before the courts on drink-drive charges and a further 16 infringement notices were issued. Overall Police are pleased with the results and the behaviour of motorists. No serious crashes relating to alcohol were recorded on the night. Overall the free PT sounds like it was a success which is great to hear. Hopefully this means AT can look at running others in the future and/or use pricing to make better use of the capacity that exists on the network at certain times of the day. Below are some of the other PT related graphs we occasionally publish, these ones are particularity relevant to the fares discussion. 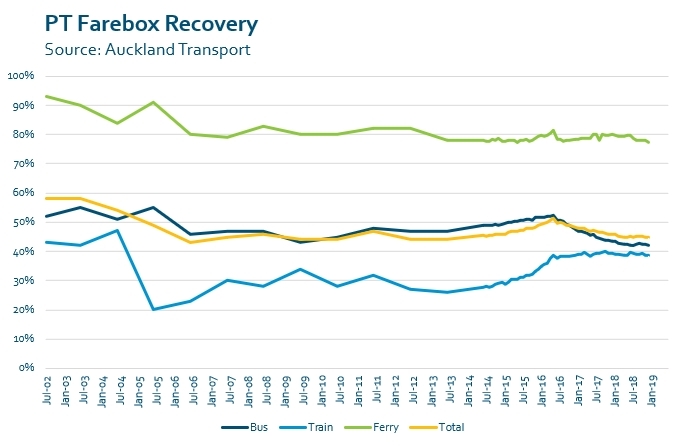 Farebox recovery ratios have continued to fall. This is primarily due to a decrease in the bus number and is a reflection of the bus network costing more to run due to the increase in service levels that came with the rollout of the new network. This isn’t the full story though, particularly for rail which tends to have longer trips than buses do. So it’s useful to also look at the subsidy per passenger km. You can see that trains have come down considerably since the introduction of electric trains and now continue to be lower than buses. Finally, AT have included a projection for January based on the results up till the 28th Jan. If this ended up being what happened it shows another good month on the cards. What a fantastic number of people using public transport on 21 December. And yes, good time of year to try it, with the available capacity. The only disappointment is that they didn’t require the use of a HOP card to get the free travel. I’m usually arguing that the hurdles of buying a HOP card (cost and few suburban outlets that sell them) work to keep people from using a HOP card when they first try PT, meaning they are exposed to the too-high cash fares, which puts them off using PT. 2/ Advertising well in advance that travel will be reduced that day, and where to get the HOP card to be able to make use of it. By having travel reduced – not free – passengers would experience the advantages of a one-journey system. I think there are still a fair few people out there who don’t realise they can swap buses and not pay any, or much, more. Will people really spend $10 on a Hop card for one-off or rare events though? As an existing Hop user, I’d be happy to take advantage of such promotions. I’m skeptical that it’d be enough to entice new users to overcome the barriers to using Hop. Yeah, I know. And I think the solution might be different for different types of promotions. I think the HOP cards should be returnable anyway. So it could even be: Pay $10 for your HOP card on the bus, and have free travel with it, but you can bring it or post it in for a refund if you don’t want to keep using it. Along with plenty of promotion beforehand about where to buy a HOP card so you’re all set up. Not being able to count passengers properly whenever they do something like this is unhelpful. So how are they going to tell who has one and who hasn’t? I’d take a freebie even though I already have two (the second is for backup so I don’t get stranded if the first gets broken or lost). How about the Friday after Anzac Day (and Easter). Errol, what exactly are AT trying? We know that people will use things when they are free. What will be the purpose of the trial? What we do know currently is that AT are locked into farebox recovery, with no indication that they have any enthusiasm for any other model, let alone where PT is free. Of course for most this travel was not free because they had to pay to get to work. So effectively half price. It is rather unsurprising that there was significant demand as travel demand is elastic with price. There is probably sufficient evidence to show that if Auckland really wants to decrease car mode share, part of the answer lies in PT pricing. Noting the drop-off on the commercial ferry routes, it’ll be interesting to see what happens over the next few months. After increasing all fares in October/November, Fullers then added a high season surcharge from 21 December to 10 February, making it $45 for an adult return fare (Auckland to Waiheke). Waiheke didn’t get free travel on 21 December (not even the buses). It might be interesting to compare patronage and drink driving incidents there against the rest of Auckland. It would be interesting, but probably not doable. Patronage could probably be compared reasonably well, but drink driving incidents would be way too small a sample size to tell. With so few incidents in all of Auckland, it would only take one on Waiheke to make a disproportionate percentage of cases, but that would easily fall within random variation. Would breath test results be a measure that could be compared? You’d need a profile for each location, of course. That Northern Busway is turning in a white elephant all right just as was predicted it would in the ’90s. Yep, its truly become a white elephant – of success. Its a real stand out. So maybe the old corollary is also true that Aucklanders do really love their cars. so much so, that many now leave them at home more often than not. Only if it’s a Toyota Corollary. Something big is brewing for this March and i hope they’re ready for it. Zero slack on the bus route i use already – it’s been absolutely chocca block by the time it gets to the last stop before the City. And no students in sight. I feel that too. You wouldn’t normally consider a holiday midweek evening would have many people out and about on buses – a few years ago I could’ve been the only one. But Waitangi evening Outer Link between Pt Chev and Mt Eden never dropped below 16 anywhere along the way at about 5:30, nor below 10 anywhere at about 9:30. It’s not a direct indication of what peak hour will be like; more an indication of the number of people using PT for much more than commuting. Yes it feels that way. But why aren’t we seeing it in these ridership numbers? Other bus increased 4.5% year on year after a massive increase in capacity via the new network. I imagine that would be less people per bus wouldn’t it? The new network rearranged the network so it was massively better, but did it add massive capacity? There were quite a few routes that extended their time into the evening, I think, which could play havoc with averages per bus…? I think it depends on your bus route, time of day etc. The changes haven’t necessarily been a positive step for people who work outside of the CBD (or major towncentre on the isthmus), I suspect. I suspect the polar opposite. The new bus network significantly reduced how much focus was given to the city centre. Look at the improvement in services to Botany, Papatoetoe, Henderson, or Albany, for example. From my own personal experience the changes have been for the worse so it’s reasonable to expect the same experience for others. All I am saying is that it has been good for some commuters, hopefully most, but at the expense of others. That is why the numbers may not be as good as some in the previous posts had hoped (I use the bus less frequently now and drive). How about cheaper fares off-peak, like London? How about cheaper fares all the time like Vienna and Prague, some of the best PT systems in the world? That is interesting to know. $1 is a far lower barrier than $10. Ferry travel is not included in public transportion. No subsidies at all. Zilch! The route from Auckland to Waiheke is one of the most expensive routes in the world per kilometre. In Australia ferry travel is included in public transport and is a vital part of moving around the city. Fullers ferries run a monopoly and as it is not subject to Auckland transport price regulation they have put up their prices for the summer and passenger numbers have been affected by these extortionate fare increases. Hey presto 4.5% decrease inspite of record tourist visitors. Actually only two ferry lines are unsubsidised, Waiheke and Devonport. That’s because of a “get out of jail free” clause in the contracts put in by Steven Joyce that means they can continue being run as a commercial service (including setting their own fares) with Auckland Transport legally forbidden from contracting other operators or services on the same routes. The other nine ferry routes in Auckland are heavily subsidised. The obvious step is to remove these clauses and have all the ferries open to competitive tendering according to gross contracts from Auckland transport, the same way all the bus and trains are run. However, that would require an act of parliament to change the law… and you can bet Fullers are lobbying hard to keep their guaranteed cash cow alive and in their hands. I agree. I mentioned this in a later comment. So vital that ferry trips are a larger proportion of PT trip in Auckland than any other city in Australasia? Auckland is a City surrounded by water. It defines the character of the city and yet the car rules. Embrace all firms of transport and subsidise alternative methods. Ferry travel requires an Act of parliament to include it in the public transport act. Then Auckland could be interconnected with electrically driven ferries as is happening in other parts of the world. Karen ferry services are indeed subsidised. Heavily. Waiheke and Devonport routes are not, however, as described above. I agree but it is only designed to get cars off the road. It needs to include transportation that cannot do this!